Robotic assisted Laparoscopic Radical Prostatectomy (RALP) is the removal of the prostate and seminal vesicles via a laparoscopic approach (keyhole surgery). The laparoscopic approach allows greater magnification and visibility than in open surgery and is associated with less bleeding, less post- operative pain and a smaller scar. The DaVinci (TM) Robotic surgical device is a tool which allows for very precise dissection and handling of tissues during laparoscopic surgery with high definition 3-D vision. Prior to the operation it is important that you perform pelvic floor exercises to strengthen the pelvic floor muscles. You will have an appointment to see a continence physiotherapist who will instruct you on how to do this. This will enable you to get bladder control back faster after the catheter is removed (about a week after the operation). You should avoid the following medications for at least a week prior to surgery: aspirin, warfarin, plavix, iscover, clopidogrel, celebrex, voltaren, vioxx, vitamin E, fish oil capsules. Do not stop any other medication without discussing it with your surgeon first. On the day of the operation you will be admitted to the hospital and be seen by the nursing staff, anaesthetist and your Surgeon prior to the procedure. All forms of Surgery carry risks to some degree. The risks of RALP include the general risks of anaesthesia, bleeding, infection, deep venous thrombosis, pulmonary embolus and death, as well as the more specific risks of ureteric and rectal injury (both <2%) and risk of open conversion. It should be remembered that these risks are small. If you are concerned about any of these risks please discuss them with your surgeon. When you wake up you will be in the recovery area. Once you are awake you will be transferred to the ward. Pain relief is most commonly achieved through a patient-controlled analgesia device (PCA). 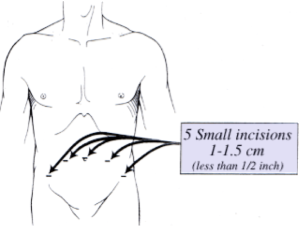 You will have a catheter in the bladder and a drain in the abdomen. The drain is removed on the first or second post-operative day, and the catheter stays in for about a week. Once you are eating normally and your pain is under control with oral analgesia, the nurses will show you how to care for your catheter and then you can be discharged home. There is no need to pass a bowel motion before discharge, but this will probably occur once you have gone home. You will have an appointment in a few days to have the catheter removed and your Surgeon will be able to tell you the results of pathological analysis of the prostate. Once the catheter is removed you will tend to have some urinary dribbling and you will probably need to wear an incontinence pad. Now you can perform the pelvic floor exercises that you were shown by the physiotherapist. The recovery of urinary continence usually occurs in three phases. Initially dribbling may be quite frequent. After a few weeks leakage may occur when getting up from a seated position, lifting heavy objects or coughing. By about three to six months after the operation, most patients do not need to wear a pad and may have leakage only on rare occasions. If incontinence continues to be a problem, an additional procedure may be required to regain urinary control. If there is a low grade, low volume cancer present, your Surgeon may elect to spare the erectile nerves. If you have normal erectile function preoperatively, and have no risk factors for erectile dysfunction ( e.g. smoking, diabetes, obesity, high blood pressure) then your chances of regaining erectile function are good, but you may need to take medication such as Viagra on a regular basis for several months to stimulate the erectile tissue. If the erections do not come back spontaneously within three to six months, you can be instructed on how to perform prostaglandin injections into the erectile tissue with prostaglandins in order to gain an erection. Penile shortening can occur post-operatively if erectile function is not preserved, but this may be prevented by use of a vacuum erection device (VED). Finally, if all else fails, a penile prosthesis is an option. Please ask your surgeon if you are interested in this. After your catheter is removed your first follow-up appointment will be six weeks after the operation and then every 3 – 6 months for 2 years. You will need to have a PSA test a few days prior to each appointment. Patients who have high grade disease which is found to have spread to the seminal vesicle or outside the capsule of the prostate may benefit from post-operative radiotherapy. Your Surgeon will discuss this with you when the pathology results are available.